WITH the FUCHS Winternationals underway at Willowbank Raceway, Australia's most successful drag racer Gary Phillips is determined to break his 10-year winless drought at the event. Phillips, who has won the Winternationals event 12 times between 1978 and 2004, is running high on confidence courtesy of a fresh ANDRA Top Alcohol Funny Car national record in his pocket. 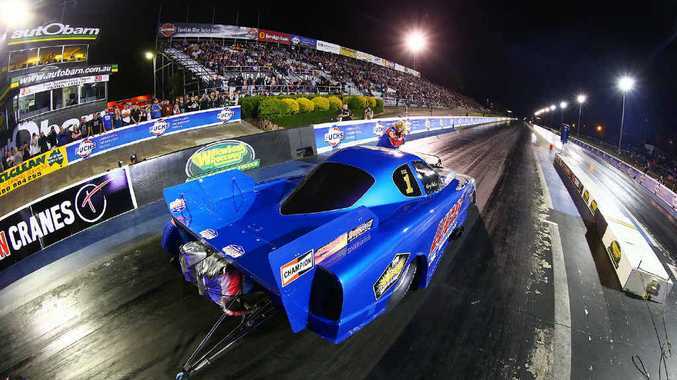 He ran a 5.438-second elapsed time for the standing quarter-mile (400m), set during Willowbank Raceway's Santos Super 3 Extreme Drag Race where he secured two round wins. "My Lucas Oil Funny Car is running well, after setting the record at Willowbank," Phillips said. "That time is only a sniff away from being the world's quickest for the class. "US Funny Car legend Frank Manzo is the quickest with his 5.411, and we went 5.438 to set the ANDRA national record." The Brisbane-based racer is the first Australian drag racer to win seven consecutive Australian championships in any class. He poured plenty of cold water on his decade-long dry-spell at the Winternationals. "I may not have won it since 2004, but there are certainly 12 other times when I have," Phillips said. "It's another race - and yes, it is a big race. However, it's hard to get to the top of the ladder, let alone stay there. There are a lot of other guys out there clamoring, and there's only one at the top. "I'd rather be the target than the arrow." Phillips, who will run in Top Alcohol and Top Doorslammer classes, knows qualifying will be important in the former with 11 cars vying for just eight available spots in eliminations. "It's imperative to get a good baseline set-up locked-in for race day," said Phillips, who runs a Chevrolet Monte Carlo in TA/FC and a 1953 Studebaker in the Top Doorslammer class. "Hopefully the weather is the same on both days because that plays a crucial role in how you prepare the car." Phillips is currently second in the championship, just 14 points adrift of leader John Cannuli. The Winternationals continue today with on-track action from 8am. Phillips and his group one challengers are on track from 1pm for their first round of qualifying. Tomorrow will host racing for sportsman brackets and the second and third qualifying sessions for group one, before race day on Sunday.